Ultimately, in this particular visit (because the book is the story of several visits), you took up your camera and began filming the response to the Russians, who are now coming in and shooting up the place -- initially, as you suggested earlier, to supply their vodka needs. But then the logic of what was going on created a battle in action that you now were in a position to cover. We should explain to the audience, you're your own cameraman, right? You don't have a producer with you. You don't have a crew with you. You have your back and a backpack, right, with the camera? I was a one-man band, and that was the way it was designed. I would like to suggest, just for memory's sake, that this was maybe one of the last pre - cell phone, pre-satellite, pre-Internet, pre-email, pre-laptop adventures that I've ever been on. This is 1995, which was basically that fulcrum year. Were I to sally forth today, I'd be a fool not go off with a satellite phone, or a cell phone, or a laptop. As a result, I would probably remain in constant communication with my editors. This was not the case then. This was not possible in 1995. I took a plunge in and I basically was lost to the world for the next month, which allowed me to achieve a level of intimacy with the subject that I would submit to you would be very, very difficult today. You know, every time the cell phone rings: "Excuse me, Hussein, but I've got to go off here and talk with my editor." "What?" But, as you suggested, there was a slow but sure escalation that began first with the vodka run, and then the response to that, and then the response to the response, and to that response, until finally Samashki was surrounded, and we were under constant sniping attack. Had I crossed a line? I never carried a gun, and I never carried a bandoleer, but at the same time, I was certainly "embedded," to use the phrase from the most recent war in Iraq. Embedded with a bunch of guerillas on the wrong side of the lines, as it were. Going off to ambush positions and becoming involved with some very, very frightening moments, at least for myself, when I started to wonder what the hell I was doing there at all. What was the point of this, aside from just a collective bang-bang to entertain Harry Kreisler back in the United States once he turns on his TV? At a certain point it became very clear that the hammer was going to come down. By that time, I had become "Toms" (this is way they mispronounce my name there), one of theirs in this little community, and Hussein decided that it was time to get me out with the tapes before I was captured, killed, the tapes seized, or whatever, and the joint project -- at this point it had become our joint project -- of defining the Chechen spirit through the lens of little Samashki would be lost. We should explain that the Chechens saw you as somebody who could tell their story to the world, which was, from their point of view, very important. That was the unspoken contract. "We will let you achieve a level of intimacy with us here, in the hopes that what you do will make a difference not only for Samashki, but for the larger Chechen story." Whether that was naïve of them or not, whether it was naïve of me to assume that I could, that's another issue entirely. So the decision was made that I had to get out with the tapes. The question was how. That was the day that the so-called first storming of the town occurred, replete with helicopter gunship rocket attacks and an armored train trying to punch its way through the town. It wasn't very pretty. 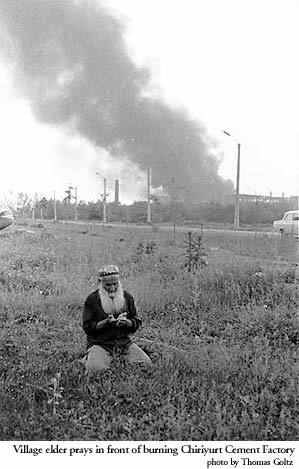 And then at this certain moment, suddenly the guns fell silent, and one of the most extraordinary and totally surreal moments in the Chechen war occurred. Down the road, having breached the lines and silenced the guns, came marching three hundred Russian mothers against the war, looking for their soldier sons. They were backed up by some twenty or thirty Russian converts to Buddhism, walking down the road in their yellow robes, shaven heads, and playing their cymbals. They were joined by several Canadian Quakers and other anti-war people from Moscow who had come down for this extraordinary march. And in the middle of the march, covering it, was a colleague of mine from the German media, Sonia Mikich, who saw me and [later] described me in her book as coming roaring out of a field, stinking of garlic, and with bloodshot eyes, about ready to chew off the head of her cameraman. This was not far from the truth. But she grabbed me by the back of the neck, threw me in her car, and said, "You are coming out with us." So I left with the mothers and the Buddhists, and got outside of Samashki, only to be surrounded by Russian forces that evening. Once again, it wasn't pretty, and what was particularly nasty about it was that we became associated with a line of Howitzers that started to punch high incendiary shells into Samashki. I was now on the far side of the lines and able to watch and record on camera the Russian forces assault the people who had been taking care of me for the last six weeks. What were your feelings as you watched that? At one level there's empathy -- you've come to identify with these people. On the other hand, you're a professional who has to get the job done and get the material out to the news media. How did you deal with all of these conflicts, or is the situation so overwhelming that you really don't have to make choices; you're sort of pushed in one direction? As a professional, you understand your duty. This was also understood even by my hosts in Samashki; that at some point I was going to have to get out and deal with the world outside of Samashki. As a professional in that situation, it means that you turn your camera on, no matter how painful it is for you, no matter how stomach-wrenching it is for you, because you've got the bang-bang and it makes for -- this is so sad -- a better story. Well, this is ultimately what happened, that I then had my story from both sides of the lines. Then I went up to Moscow and put together the story that eventually showed on PBS in 1996. And for which you won an award, which you have right here. You might show the camera, actually, this award. It's named after a prominent journalist, the Peck Award, right? The Rory Peck Award. I didn't win it. This is, actually, a consolation prize. But I was one of four finalist as a result of the show that I put together for PBS. I was very glad that I did not win the award, because in 1997 the only previous winners of the Rory Peck Award were dead. This was the first year of the award that the actual finalists were all still alive. Almost by definition, to win a Rory Peck, you had to go off and do something so insane that ... well, basically, a condition for the award is that it is life-threatening. Anyway, this is where things started getting very curious. At the award ceremony in London, at the reception following, the main speaker of the BBC came up to me and said, "We at the BBC thought you should have won the Rory Peck Award this year for your work on your little town of Samashki." I said, "Oh, thank you, thank you." And he said, "I'm not offering just cheap consolation. I'm offering you a job. I want you to go back to your little town that you've so romanticized. I want you to find that commander, your friend Hussein, to find out if he's still alive or if he's dead. What happened there? And, more importantly, what was the impact of your presence there? I want you to do an aftermath." I said, " I'll take the job." So the book -- and we're not going to give away the end, we're going to make people buy the book because, I must say, it's a fascinating read -- but I do want to talk about the philosophical issue, which you came to understand. You quote from the famous physicist, Heisenberg, who, in essence, says: "The observer affects the observed." This, in a way, is your Shakespearean quote at the beginning of the work, because in this second trip where you do find Hussein, you talk to him and you unravel his story, you discover something about yourself as a journalist. The book, in a way, is your story, also. What is it you discovered, the impact that you hadn't intended? If you want to give it away, that's fine with me. The essence ... Maybe this is it. The essence is that the journalist is not a perfectly neutral vessel. We pretend to be, but there's no way you can remain a perfectly neutral vessel, especially in a crisis zone. When somebody is feeding and protecting you, and housing you, by definition, this will engender loyalties and a certain spin or a twist. So you might say this is terribly obvious, but, nonetheless, in the media today there seems be this pretense that we are completely neutral vessels, even to the point of the embedded correspondents in what passed for war in Iraq in March and April of this year. I was, quite frankly, nauseated just watching these so-called neutral vessels give neutral news as they were sharing flack jackets and gas masks with the American military as it lurched forward or ran forward across the deserts of Iraq. This is not neutral. I'm not going to put a value judgment on it, whether it's good or bad, but it's certainly not neutral. Let's at least admit that. Back to the title, or rather the subtitle of the book, why I disagree with it and why I think it's appropriate to talk about this right now, is that it says, "War Correspondent’s Story of Surviving the War in Chechnya." The title of the book is Chechnya Diary. By definition, it's my story, if my name's on the thing. We don't need to repeat that. And I think the subtitlemisses the entire [point] and it shifts the emphasis to the vessel or to the recorder, namely the journalist, the war correspondent, as opposed to the event. I wanted, and I fought for having the word "Samashki" in the subtitle. I wanted and fought for having the word "aftermath" in the subtitle. I wanted and fought for having the word "massacre" in the subtitle, like, Samashki: The Story of the Story of a Massacre and Its Aftermath, thus moving the emphasis away from the journalist. But the marketing people had their way. I was seven hundred days late in bringing the manuscript to them, and I didn't have any chips left on the table.